SonlightBlog.com: I think I can do this! I have been tossing around the idea of homeschooling my daughter since the day I found out I was pregnant with her. I finally made the decision that starting in Kindergarten I would be a homeschool mom! I researched for months looking for the right curriculum and I found that I loved how Sonlight had packages with instructors guides and tons of really cool books. This will be my first year homeschooling, so I really felt that I needed a curriculum that not only taught my daughter but also helped teach me how to homeschool. 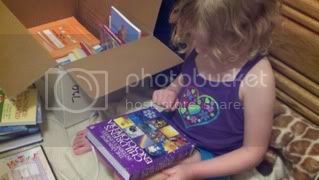 My daughter is an extremely curious little girl so when I opened the boxes up she was right there with me going through each book. She meticulously placed each book in a pile according to size and told me which ones she was going to read first! 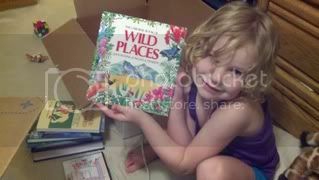 She is so interested in animals that we immediately had to look through the Frogs and Tadpoles book. After being able to go through the boxes and get everything organized, I sat down with the instructors guide and read through it. It was so wonderfully laid out and I love that I have everything I need to get her started and loving school! We are taking some vacations and "school" won't be starting until September but my daughter is asking everyday if it's time for school yet. I am taking the summer to read all of her books and even I am excited with the wide range of literature that is covered. I do not remember learning any of this when I was in Kindergarten so I am excited for my daughter. I finally feel like I CAN do this and it will be a wonderful journey with the help of Sonlight! Yay Alison!! We have been homeschooling since last year and we will be doing K next year! I'm also so excited by the material! You definitely made the right choice. You will be greatly blessed and bring an abundance of joy into your family.